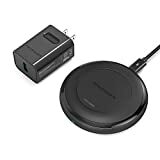 Whether you have a new iPhone XS, a Samsung Galaxy phone, or you plan to pick up one of Google’s just-announced Pixel 3 handsets, you need a good wireless charger to go along with them. And if you ask us, it doesn’t get any better than the RAVPower HyperAir Fast Wireless Charging Pad. It offers 7.5W fast wireless charging for last year’s iPhone models as well as 10W fast wireless charging for the iPhone XS and Android phones that support it. The HyperAir is also made of high-quality aluminum instead of cheap plastic, and it has a rubbery ring on the top to enure that your phone won’t slide around. It cost $50 when it was first released and now it’s down to $30, but an extra $6 coupon on Amazon’s site drops the price to an all-time low.